"TuneIn Radio is designed to give you a way to listen to streaming radio from anywhere in the world. If you're traveling abroad and feeling a little homesick and want to hear the local news, or if you just want a broader perspective on the events of the day than what you're getting where you live, TuneIn Radio can help." TuneIn Radio allows you to listen to upwards of 30,000 AM and FM radio stations that are that are streaming or simulcasting on the Internet. The app is available in the Windows Phone Marketplace, and is functionally equivalent to the same app for IOS devices (e.g. iPhone and iPad). Features include the ability to find stations specifically by call letter if you're looking for one station, or browse stations by location, language, or genre. TuneIn Radio is really handy if you want to listen to a radio station while roaming around. Launch the app, click on Local Radio, and you are quickly presented with a list of the local stations broadcasting on the Internet. Click on your choice and you are listening within seconds. The app has lots of features, including setting alarms and sleep timers. A really interesting feature of TuneIn Radio is to do a live search for a particular song. 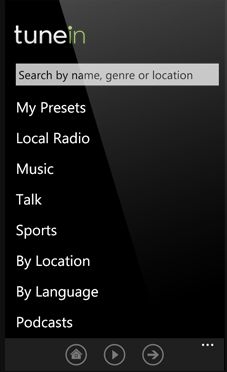 If a station is broadcasting RDS information, TuneIn Radio can search it and determine if they are playing the song you are looking for. TuneIn Radio is an impressive and effective app that should be in your collection if you like listening to broadcast radio. Wasn't this already discussed in the app roundup in late Feb? Good internet radio btw... has all my local stations and some I didn't even know had internet feeds!